Artificial Intelligence (AI) is becoming more prevalent as a component of marketing technology solutions. The promise for AI seems huge in part by what people think it is, what it can do, and what others say about it. 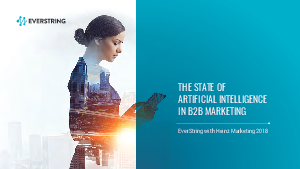 EverString and Heinz Marketing conducted the first ever survey to understand how B2B marketers view AI currently and how they envision using AI as a strategic tool to help meet their goals and objectives.